Who Profits From the Quest for Understanding? * Changing your mind because of emotion is faith. * Changing your mind because of thinking is philosophy. * Changing your mind because of facts is science. * Changing your mind because of manipulation is mind control. Summary: Millions flock to group trainings and leadership programs to improve their personal lives and business acumen – to increase their personal power, adaptation, and effectiveness in the world at large. 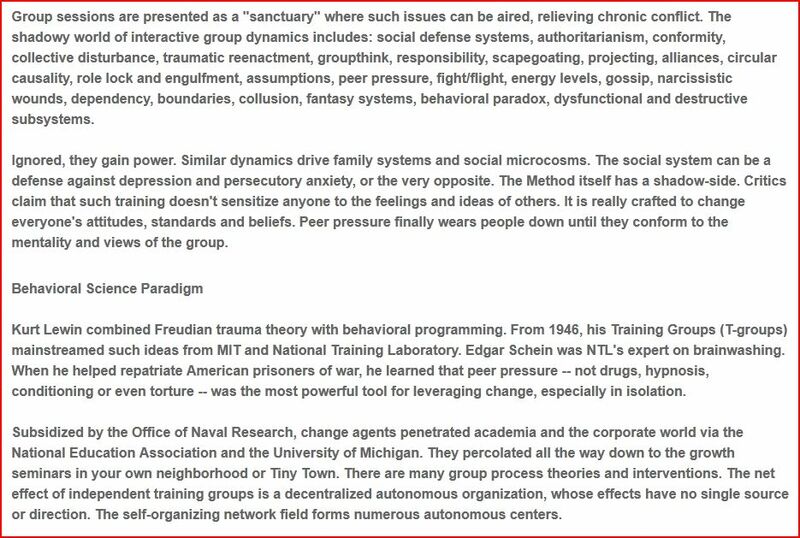 Such protocols have a long history, rooted in the dark soil of programs developed through Tavistock Institute, and spread via the T-groups of Kurt Lewin through MIT and mainstreamed through academia, the military, and the corporate world via the University of Michigan. Such programs create what were once called “change agents”, then “transformation agents”, and now “subject-matter experts” who seed large groups with process-oriented change. They are presented as necessary reforms within bureaucracies to keep pace with the times. But they function as directional drivers of cultural change. Such notions arose and were spread by think tanks funded by large Foundations. Thus, ideas mediated and facilitated the consolidation of power in the hands of the few in the name of social and educational reform. Such “sensitivity training” formed the basis of Gestalt, EST and Esalen-type therapies that are the foundation of the Human Potential Movement, personality psychology, and transpersonal therapies. Esalen never aimed at training individuals for group activity. Naturally, they produced personal value for many, but the process also has a naked underbelly that can be seen in its shadowy effect on our culture and consciousness today. This protracted revolution can be seen in the so-called “Aquarian Conspiracy” of the new age to the halls of the Pentagon. “Effects”, rather than alleged “intent”, is a way to focus on the meaning and practical results of such training, and who it serves. The bottom line is that what is transformed is the paradigm, zeitgeist or worldview of the general population. It dominates business and how the world is controlled with psystrat. No one can resist what they cannot detect. The result is a metaphorical “fracking” of your brain. "Nothing at last is sacred but the integrity of your mind." so that every man may come to himself and avoid slavery." --Carl Jung, The Red Book, Page 352.
standing around in sullen groups and that mutter gets louder and louder." Millions voluntarily flock to group trainings and leadership programs, forking out large fees to improve their personal lives and business prospects – to increase their personal power, adaptation, relationships, and effectiveness at work and in the world at large. Few realize the pernicious history of such self-development training with its "missionary zeal." The least effect is letting powerful sociopaths tell us what makes us happy. As the saying goes, those who do not know history are doomed to repeat it. People may be born with different traits and capacities that suit them for leadership. Unfortunately, many of these qualities are shared with psychopaths, whose charming and aggressive ploys help them rise to the top of their chosen fields. Learning a skill is not mastering one and can imply most leaders are born, not made. You cannot teach charisma. Vision and persuasion are arts we cannot implant. Leaders rise to a challenge, but narcissistic, monetary or political secondary-gains may be involved. Many well-meaning people have participated enthusiastically in variations of "sensitivity training" and group relations. They need to recognize and own the shadow side of the method to grasp where these ideas come from. Those forced into training sessions are less zealous. Social groups are a high-leverage force for influencing behavior. 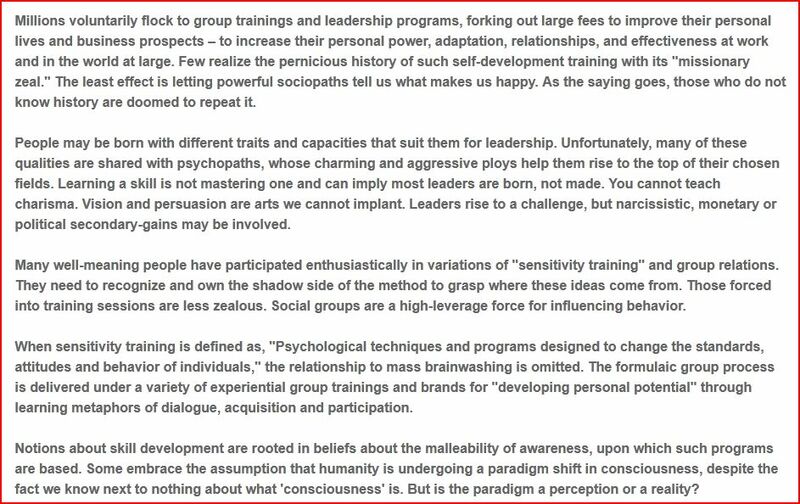 When sensitivity training is defined as, "Psychological techniques and programs designed to change the standards, attitudes and behavior of individuals," the relationship to mass brainwashing is omitted. The formulaic group process is delivered under a variety of experiential group trainings and brands for "developing personal potential" through learning metaphors of dialogue, acquisition and participation. Notions about skill development are rooted in beliefs about the malleability of awareness, upon which such programs are based. Some embrace the assumption that humanity is undergoing a paradigm shift in consciousness, despite the fact we know next to nothing about what 'consciousness' is. But is the paradigm a perception or a reality? We make tacit assumptions about evolution, progress, collective consciousness, complexity, and why they matter. 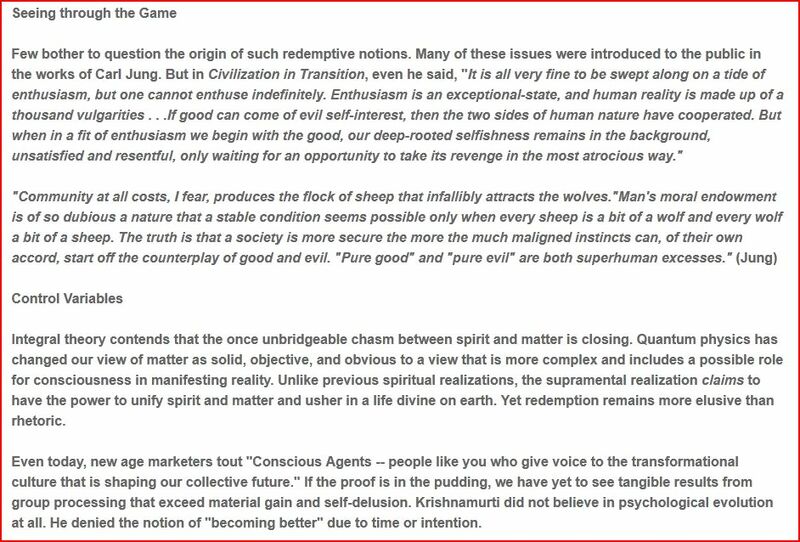 They permeate the environment, couched in religious, psychological, and new agey lingo from metaphors of "paradigm shift" and "awakening" to "ascending", "transhumanism," and the umbrella term, "transformation." A perennial theme of humankind, transformation has been explored in religion, psychology and art. As a rite of passage, it can include a psychological and sacred dimension. In psychology, the term has been curiously defined as "the procedure used when unconscious desires or urges are costumed in order to emerge in consciousness." Yet, Jung (CW 12, par. 32) cautioned that we must be alone to find out what it is that supports us when we can no longer support ourselves. Only this experience, he said, gives us an indestructible foundation. The path is beset with obstacles. 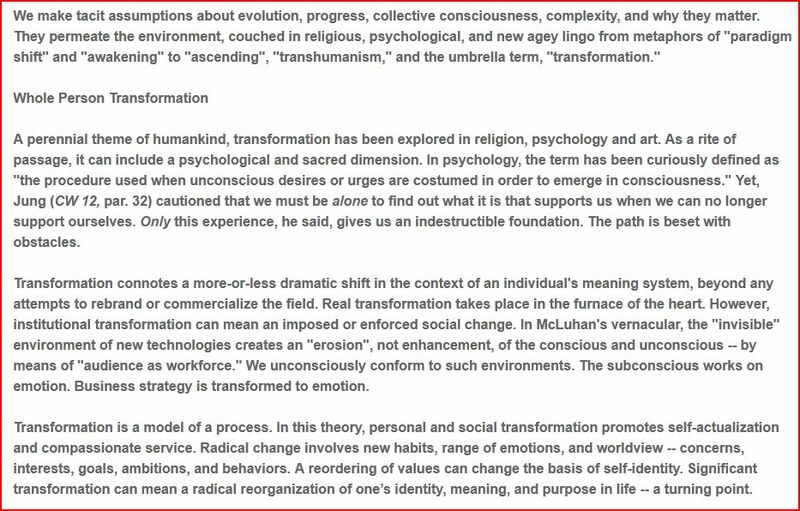 Transformation connotes a more-or-less dramatic shift in the context of an individual's meaning system, beyond any attempts to rebrand or commercialize the field. Real transformation takes place in the furnace of the heart. However, institutional transformation can mean an imposed or enforced social change. In McLuhan's vernacular, the "invisible" environment of new technologies creates an "erosion", not enhancement, of the conscious and unconscious -- by means of "audience as workforce." We unconsciously conform to such environments. The subconscious works on emotion. Business strategy is transformed to emotion. Transformation is a model of a process. In this theory, personal and social transformation promotes self-actualization and compassionate service. Radical change involves new habits, range of emotions, and worldview -- concerns, interests, goals, ambitions, and behaviors. A reordering of values can change the basis of self-identity. Significant transformation can mean a radical reorganization of one’s identity, meaning, and purpose in life -- a turning point. 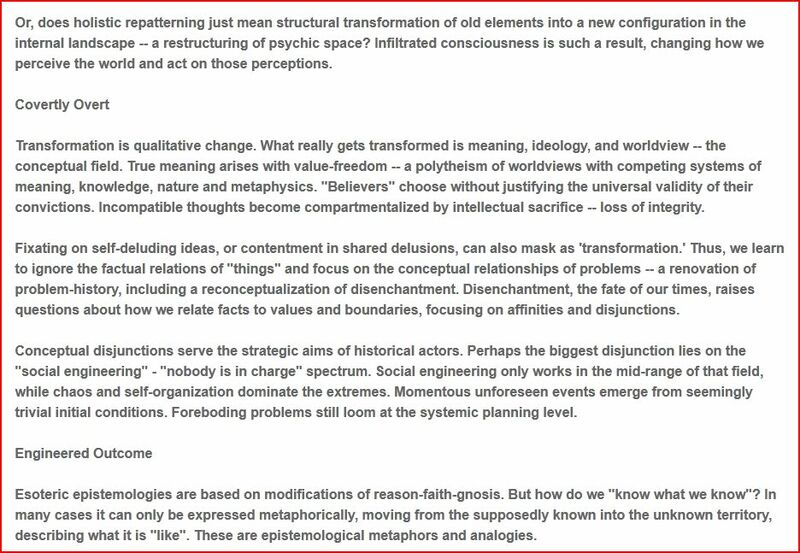 Or, does holistic repatterning just mean structural transformation of old elements into a new configuration in the internal landscape -- a restructuring of psychic space? Infiltrated consciousness is such a result, changing how we perceive the world and act on those perceptions. Transformation is qualitative change. What really gets transformed is meaning, ideology, and worldview -- the conceptual field. True meaning arises with value-freedom -- a polytheism of worldviews with competing systems of meaning, knowledge, nature and metaphysics. "Believers" choose without justifying the universal validity of their convictions. Incompatible thoughts become compartmentalized by intellectual sacrifice -- loss of integrity. Fixating on self-deluding ideas, or contentment in shared delusions, can also mask as 'transformation.' Thus, we learn to ignore the factual relations of "things" and focus on the conceptual relationships of problems -- a renovation of problem-history, including a reconceptualization of disenchantment. Disenchantment, the fate of our times, raises questions about how we relate facts to values and boundaries, focusing on affinities and disjunctions. Conceptual disjunctions serve the strategic aims of historical actors. Perhaps the biggest disjunction lies on the "social engineering" - "nobody is in charge" spectrum. Social engineering only works in the mid-range of that field, while chaos and self-organization dominate the extremes. Momentous unforeseen events emerge from seemingly trivial initial conditions. Foreboding problems still loom at the systemic planning level. Esoteric epistemologies are based on modifications of reason-faith-gnosis. But how do we "know what we know"? In many cases it can only be expressed metaphorically, moving from the supposedly known into the unknown territory, describing what it is "like". These are epistemological metaphors and analogies. Metaphors create realities in our conceptual system. We relate emotionally to the notion of 'transformation' in typical metaphors, such as from being asleep to awakening. At best, they are "as if" realities. Classical metaphors of transformation include death to rebirth, darkness to enlightenment, fragmentation to wholeness, journey to destination (arriving; homecoming), and organic unfolding. In the master narrative, we are travellers, or miners, or ascender/descenders. The fundamental assumption is that higher knowledge can be achieved by those who seek it. Disenchantment arises from rationalization, intellectualization and evidential discourse. The disenchanted mentality is the hallmark of bureaucracy and governance, which support the technology of production, social ordering and management of nature. This ideological superstructure creates a hunger for re-enchantment that can be channeled for its political or corporate ends. Knowledge and experience create a feedback loop. Perspective transformation is cognitive and emotional. Transformation of meaning is linked to therapeutic change, a modification of behavior by modifying attitudes and beliefs. It is also linked to large scale infiltration of professional and social lives, recruitment, and methodical conditioning in the name of improving personal skills. In 1967, Marshall McLuhan suggested, "all of us have become the unwitting workforce of social change." John Rawlings Rees developed the prototype Tavistock Method for "psychologically controlled environments" to manipulate participants with peer pressure. Despite the nondirective rhetoric, managers provide the perception and conditioning -- replacing external restraint with internal compulsion. "Psychotechnologies" induce trance states and encourage dissociation. Individuals are vulnerable to 'soft' social technologies as well as the hardware of communications systems and digital life. Emotional states transfer through emotional contagion, with peer pressure echoing "audience as workforce." Reducing defensiveness erodes self-integrating preferences of self-identity. Myths develop around the cult of leadership when it is actually the followers who follow. In many cases, they would be fired if they didn't. 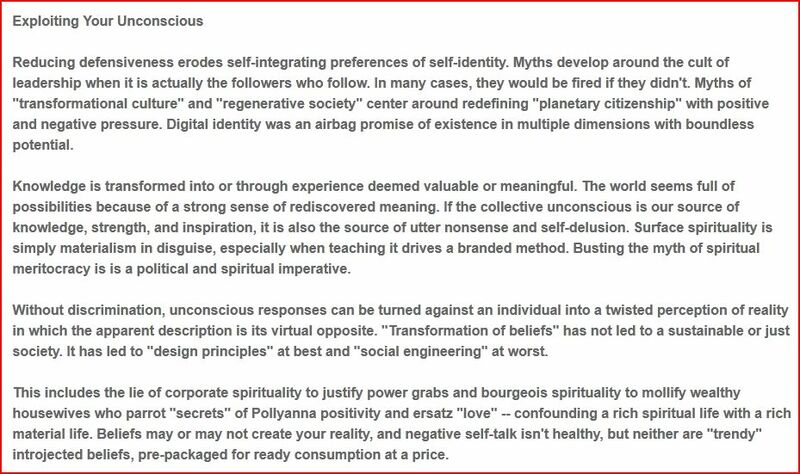 Myths of "transformational culture" and "regenerative society" center around redefining "planetary citizenship" with positive and negative pressure. Digital identity was an airbag promise of existence in multiple dimensions with boundless potential. Knowledge is transformed into or through experience deemed valuable or meaningful. The world seems full of possibilities because of a strong sense of rediscovered meaning. If the collective unconscious is our source of knowledge, strength, and inspiration, it is also the source of utter nonsense and self-delusion. Surface spirituality is simply materialism in disguise, especially when teaching it drives a branded method. Busting the myth of spiritual meritocracy is is a political and spiritual imperative. Without discrimination, unconscious responses can be turned against an individual into a twisted perception of reality in which the apparent description is its virtual opposite. "Transformation of beliefs" has not led to a sustainable or just society. It has led to "design principles" at best and "social engineering" at worst. This includes the lie of corporate spirituality to justify power grabs and bourgeois spirituality to mollify wealthy housewives who parrot "secrets" of Pollyanna positivity and ersatz "love" -- confounding a rich spiritual life with a rich material life. Beliefs may or may not create your reality, and negative self-talk isn't healthy, but neither are "trendy" introjected beliefs, pre-packaged for ready consumption at a price. 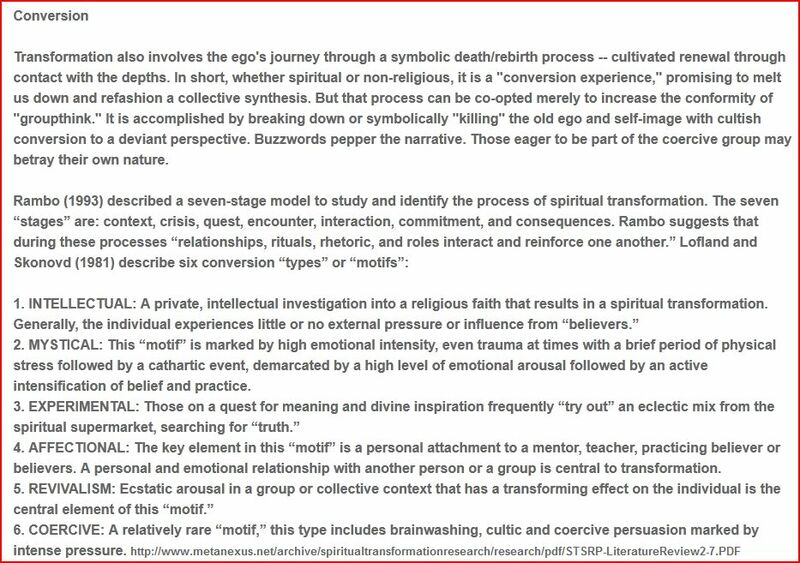 Transformation also involves the ego's journey through a symbolic death/rebirth process -- cultivated renewal through contact with the depths. In short, whether spiritual or non-religious, it is a "conversion experience," promising to melt us down and refashion a collective synthesis. But that process can be co-opted merely to increase the conformity of "groupthink." It is accomplished by breaking down or symbolically "killing" the old ego and self-image with cultish conversion to a deviant perspective. Buzzwords pepper the narrative. Those eager to be part of the coercive group may betray their own nature. 2. MYSTICAL: This “motif” is marked by high emotional intensity, even trauma at times with a brief period of physical stress followed by a cathartic event, demarcated by a high level of emotional arousal followed by an active intensification of belief and practice. 4. AFFECTIONAL: The key element in this “motif” is a personal attachment to a mentor, teacher, practicing believer or believers. A personal and emotional relationship with another person or a group is central to transformation. Utopian ideas are rooted in the hope that this hypothetical shift in collective awareness will rescue civilization from its economic and ecological predicament. The paradigm shift or new perspective is therefore presented as a "salvific" formula as well as worldview. It is adaptive self-overcoming. Many individual and collective approaches have been suggested for raising awareness, but numerous obstacles form roadblocks to such idealistic transformation. Who decides which transformations are admissible, which cross the line, and which are trickster transgressions? "Regression in the service of the group" becomes necessary and seemingly adaptive, especially where participation is mandatory. Researchers report that T-groups show such regression, conflicts, anxiety, and dissociation -- sometimes to the point of hallucinations, delusions, and loss of space-time orientation. They become the transformers and arbiters of human character. But the end result is more homogenization than individuation, because it comes with historical baggage and a political agenda aimed at cultural transformation. Under any brand name, techno-social engineering is emotional engineering that increases tolerance for manipulation, maladaption and dissociation. Transformation can be imposed. The game is purposefully rigged to reinforce the illusion of free will. Transformational leadership means the leader identifies the needed change, creates a vision to guide the change through inspiration, and executes the change with the commitment of the members of the group. 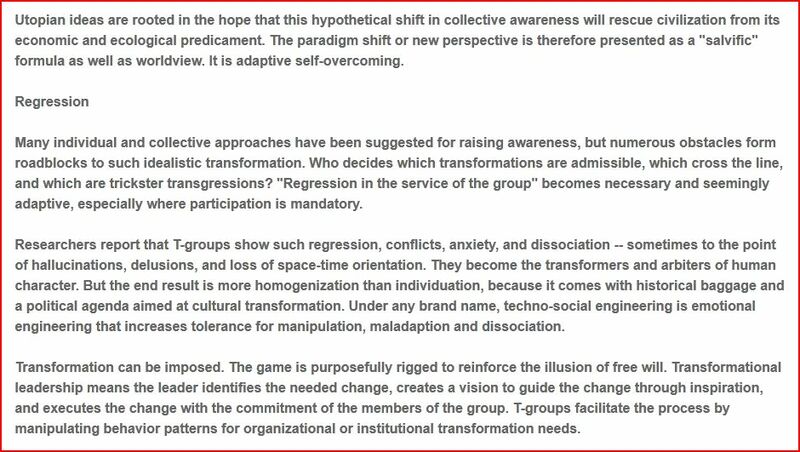 T-groups facilitate the process by manipulating behavior patterns for organizational or institutional transformation needs. Few bother to question the origin of such redemptive notions. Many of these issues were introduced to the public in the works of Carl Jung. But in Civilization in Transition, even he said, "It is all very fine to be swept along on a tide of enthusiasm, but one cannot enthuse indefinitely. Enthusiasm is an exceptional-state, and human reality is made up of a thousand vulgarities . . .If good can come of evil self-interest, then the two sides of human nature have cooperated. But when in a fit of enthusiasm we begin with the good, our deep-rooted selfishness remains in the background, unsatisfied and resentful, only waiting for an opportunity to take its revenge in the most atrocious way." Integral theory contends that the once unbridgeable chasm between spirit and matter is closing. Quantum physics has changed our view of matter as solid, objective, and obvious to a view that is more complex and includes a possible role for consciousness in manifesting reality. Unlike previous spiritual realizations, the supramental realization claims to have the power to unify spirit and matter and usher in a life divine on earth. Yet redemption remains more elusive than rhetoric. Even today, new age marketers tout "Conscious Agents -- people like you who give voice to the transformational culture that is shaping our collective future." If the proof is in the pudding, we have yet to see tangible results from group processing that exceed material gain and self-delusion. Krishnamurti did not believe in psychological evolution at all. He denied the notion of "becoming better" due to time or intention. Our transformational fantasies may just be mental arrogance and spiritual immaturity. In the evolutionary sense, we still walk on all fours. How can we become suprahuman without first becoming more fully human, especially if "the wolf" guards the door -- or is it now "the portal"? Ancient wisdom finds itself in an uneasy marriage with modern management science, triangulated by an elitist agenda. In the quest for understanding, who profits? Protocols for ferreting out and morphing unconscious personal and group dynamics have a long history. They are rooted in the dark soil of models developed through the Tavistock Institute. 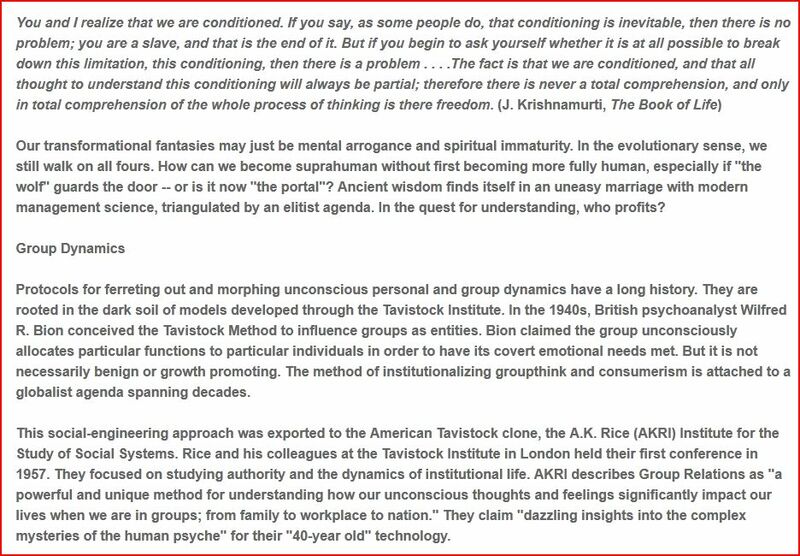 In the 1940s, British psychoanalyst Wilfred R. Bion conceived the Tavistock Method to influence groups as entities. Bion claimed the group unconsciously allocates particular functions to particular individuals in order to have its covert emotional needs met. But it is not necessarily benign or growth promoting. The method of institutionalizing groupthink and consumerism is attached to a globalist agenda spanning decades. This social-engineering approach was exported to the American Tavistock clone, the A.K. Rice (AKRI) Institute for the Study of Social Systems. Rice and his colleagues at the Tavistock Institute in London held their first conference in 1957. They focused on studying authority and the dynamics of institutional life. AKRI describes Group Relations as "a powerful and unique method for understanding how our unconscious thoughts and feelings significantly impact our lives when we are in groups; from family to workplace to nation." They claim "dazzling insights into the complex mysteries of the human psyche" for their "40-year old" technology. Tavistock invented think tank and conference culture as part of their Great Plan agenda to influence politicians, educators, military, and corporate leaders. They spread their Executive Leadership program for communication, consulting and change management through National Training Laboratories within conference settings and in the workplace. 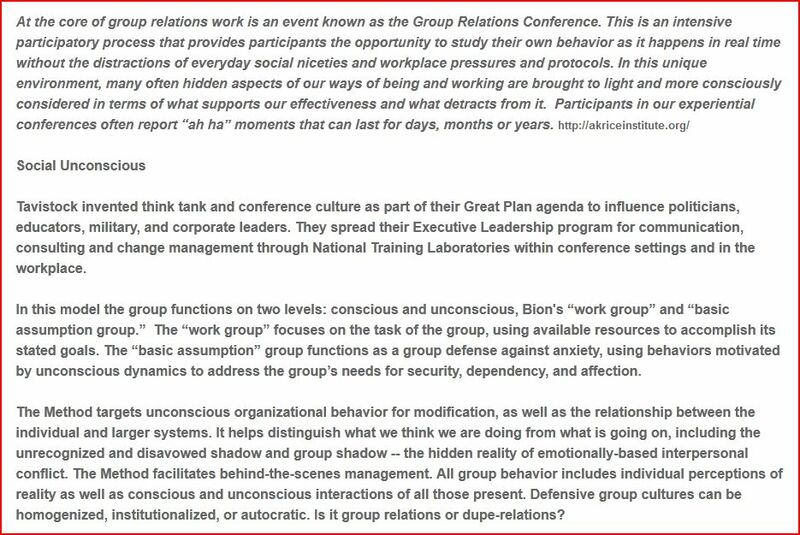 In this model the group functions on two levels: conscious and unconscious, Bion's “work group” and “basic assumption group.” The “work group” focuses on the task of the group, using available resources to accomplish its stated goals. The “basic assumption” group functions as a group defense against anxiety, using behaviors motivated by unconscious dynamics to address the group’s needs for security, dependency, and affection. The Method targets unconscious organizational behavior for modification, as well as the relationship between the individual and larger systems. It helps distinguish what we think we are doing from what is going on, including the unrecognized and disavowed shadow and group shadow -- the hidden reality of emotionally-based interpersonal conflict. The Method facilitates behind-the-scenes management. All group behavior includes individual perceptions of reality as well as conscious and unconscious interactions of all those present. Defensive group cultures can be homogenized, institutionalized, or autocratic. Is it group relations or dupe-relations? Group sessions are presented as a "sanctuary" where such issues can be aired, relieving chronic conflict. The shadowy world of interactive group dynamics includes: social defense systems, authoritarianism, conformity, collective disturbance, traumatic reenactment, groupthink, responsibility, scapegoating, projecting, alliances, circular causality, role lock and engulfment, assumptions, peer pressure, fight/flight, energy levels, gossip, narcissistic wounds, dependency, boundaries, collusion, fantasy systems, behavioral paradox, dysfunctional and destructive subsystems. Ignored, they gain power. Similar dynamics drive family systems and social microcosms. The social system can be a defense against depression and persecutory anxiety, or the very opposite. The Method itself has a shadow-side. Critics claim that such training doesn't sensitize anyone to the feelings and ideas of others. It is really crafted to change everyone's attitudes, standards and beliefs. Peer pressure finally wears people down until they conform to the mentality and views of the group. Kurt Lewin combined Freudian trauma theory with behavioral programming. From 1946, his Training Groups (T-groups) mainstreamed such ideas from MIT and National Training Laboratory. Edgar Schein was NTL's expert on brainwashing. When he helped repatriate American prisoners of war, he learned that peer pressure -- not drugs, hypnosis, conditioning or even torture -- was the most powerful tool for leveraging change, especially in isolation. Subsidized by the Office of Naval Research, change agents penetrated academia and the corporate world via the National Education Association and the University of Michigan. They percolated all the way down to the growth seminars in your own neighborhood or Tiny Town. There are many group process theories and interventions. The net effect of independent training groups is a decentralized autonomous organization, whose effects have no single source or direction. The self-organizing network field forms numerous autonomous centers. NTL still promotes "self-awareness". For $3000 they will help you process your "unresolved issues." Critics allege that these controversial group manipulation techniques mimic brainwashing tactics. The government gold-standard was the Six Sigma program. Six Sigma is a set of techniques and tools for process improvement. It is about quality control not personal development -- about products, not people. It was developed by Motorola in 1986. In 1995 it became the business strategy at General Electric. By the late 1990s, about two-thirds of Fortune 500 organizations used Six Sigma to reduce costs and improve quality. It is still used in many industrial sectors. But it's more of a management fad -- "process excellence" -- than a self-development training. Such programs create what were once called “change agents”, then “transformation agents”, and now “subject-matter experts,” or even color-coded belted "ninjas" who perform organizational diagnosis and seed large groups with process-oriented change. Meanwhile personality cults, social seminars and conferences adapted their strategies aimed at individuals for their own ends. Facilitators help participants experience group-based opportunities to study their own behavior. But is this transformation or imposed role implementation? How about when applied to corporate gamesmen with a relentless desire to win? Such techniques don’t seem toxic on the surface. They are presented as necessary reforms within bureaucracies to keep pace with the times. But they function as pacification and directional drivers of cultural change. Such notions arose in and were spread by globalist think tanks funded by large Foundations. Thus, ideas mediated and facilitated the consolidation of power in the hands of the few in the name of social reform.The term 'smart power' was coined to complement U.S. military and economic might with greater investments in soft power. 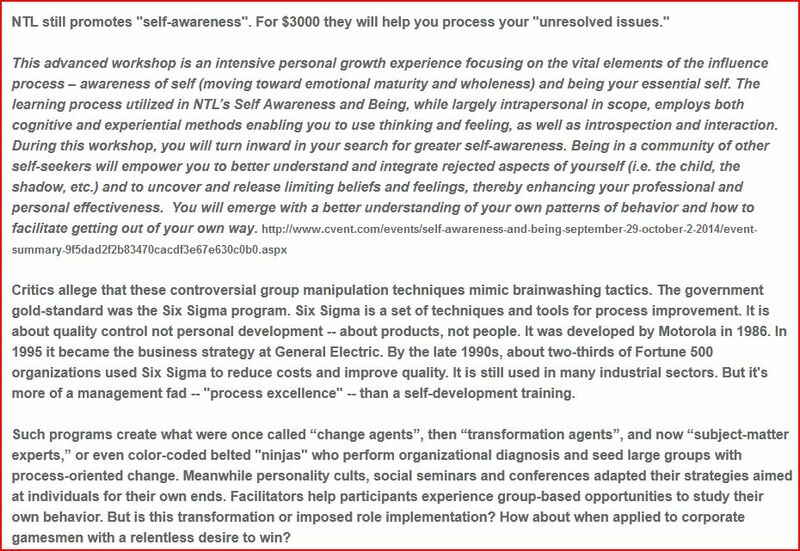 Government and foundations subsidized group relations training as a form of psychological warfare. "In singleness every man shall place himself above the other, so that every man may come to himself and avoid slavery." --Carl Jung, The Red Book, Page 352. Douglas McGregor wrote The Human Side of Enterprise (1960). 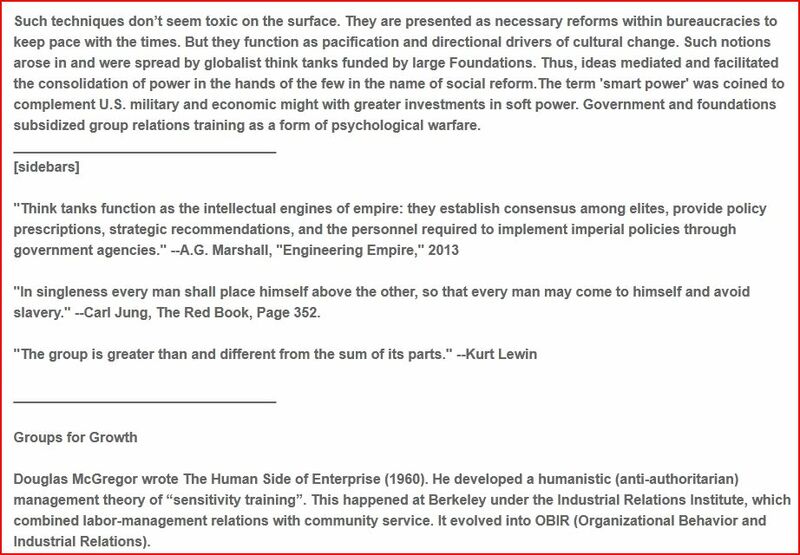 He developed a humanistic (anti-authoritarian) management theory of “sensitivity training”. This happened at Berkeley under the Industrial Relations Institute, which combined labor-management relations with community service. It evolved into OBIR (Organizational Behavior and Industrial Relations). They brought NTL to UCLA in 1954, forming the Western Training Lab. Other new developments came from Western Behavioral Science Institute (WBSI) in La Jolla, California. Encounter groups are the most effective way to manage social change by manipulating peer pressure. "Sensitivity training” formed the basis of humanistic psychology, Gestalt, Transactional Analysis, EST and Esalen-type therapies that are the foundation of the Human Potential Movement, personality psychology, and transpersonal therapies. They echoed the occult potential described far earlier in the Corpus Hermeticum. The promise of "infinite potential" is the mental health equivalent of the promise of the equally elusive "free energy" of vacuum physics. 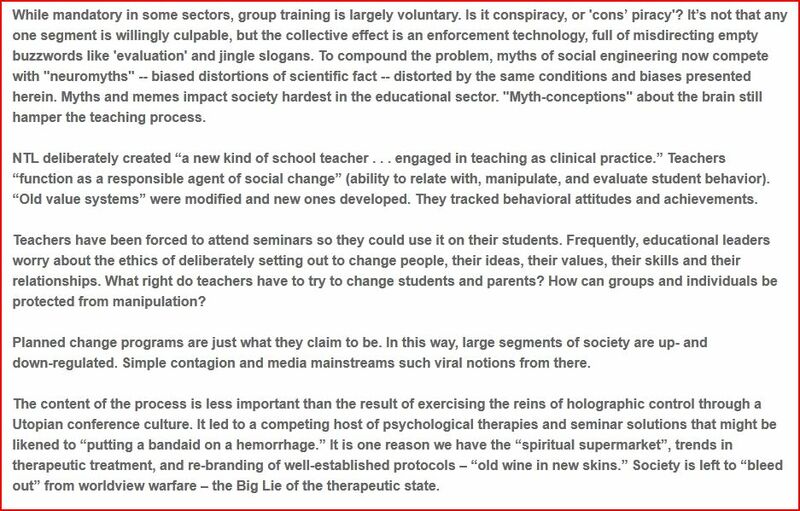 But what is presented as therapy is actually social engineering, no matter how “nondirective” the processing designed to catalyze personal transformation claims to be. Large groups (above 30-35 people) are a social matrix or groupmind that mobilizes the social unconscious: confusion, aggression, conflict. The "internet unconscious" is easily visible on any social network. Large groups work best with societal or organizational issues. Even group therapy has been criticized as pop psychology and brainwashing. 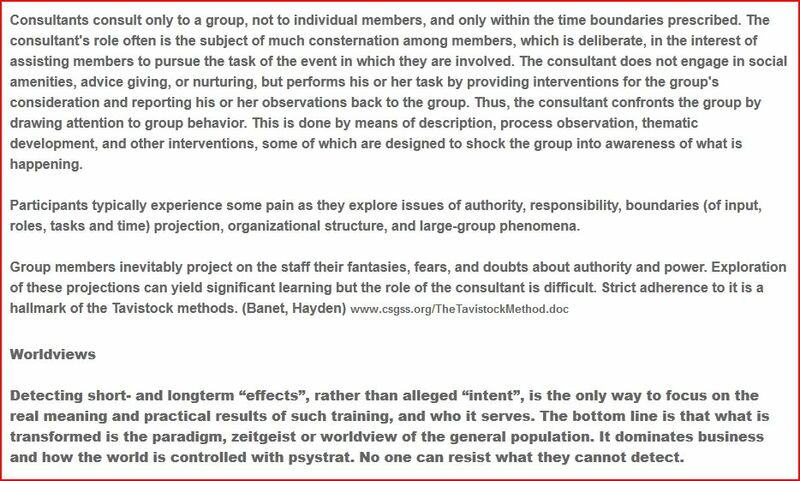 Group therapists train in T-groups. 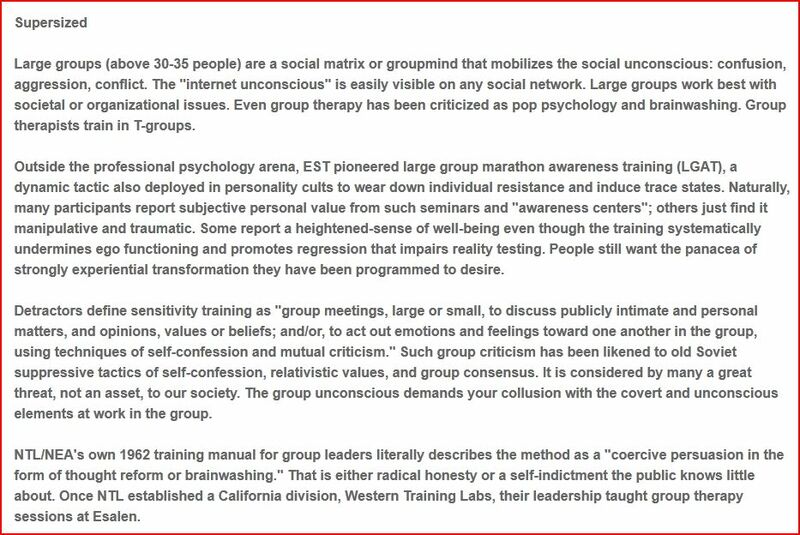 Outside the professional psychology arena, EST pioneered large group marathon awareness training (LGAT), a dynamic tactic also deployed in personality cults to wear down individual resistance and induce trace states. Naturally, many participants report subjective personal value from such seminars and "awareness centers"; others just find it manipulative and traumatic. Some report a heightened-sense of well-being even though the training systematically undermines ego functioning and promotes regression that impairs reality testing. People still want the panacea of strongly experiential transformation they have been programmed to desire. Detractors define sensitivity training as "group meetings, large or small, to discuss publicly intimate and personal matters, and opinions, values or beliefs; and/or, to act out emotions and feelings toward one another in the group, using techniques of self-confession and mutual criticism." Such group criticism has been likened to old Soviet suppressive tactics of self-confession, relativistic values, and group consensus. It is considered by many a great threat, not an asset, to our society. The group unconscious demands your collusion with the covert and unconscious elements at work in the group. NTL/NEA's own 1962 training manual for group leaders literally describes the method as a "coercive persuasion in the form of thought reform or brainwashing." That is either radical honesty or a self-indictment the public knows little about. Once NTL established a California division, Western Training Labs, their leadership taught group therapy sessions at Esalen. NTL trained the trainers of government and industry. 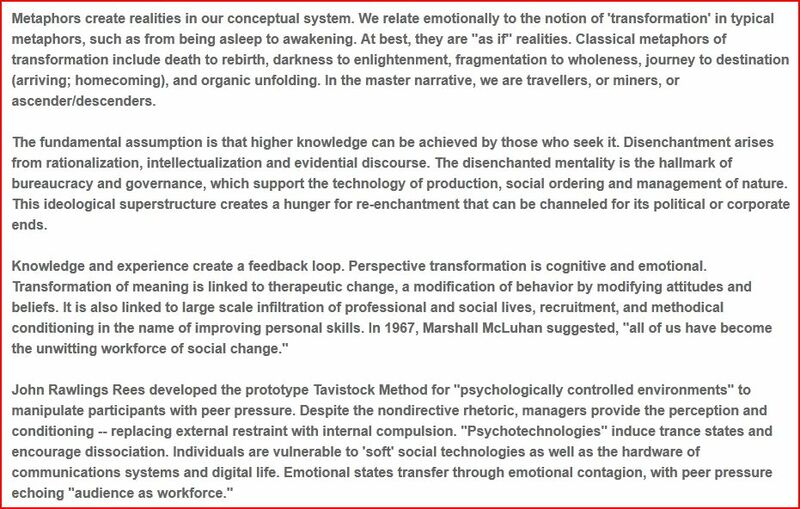 Tavistock was only interested in control, not "peak experiences." Esalen mass marketed the method to the counterculture and self-help industry. 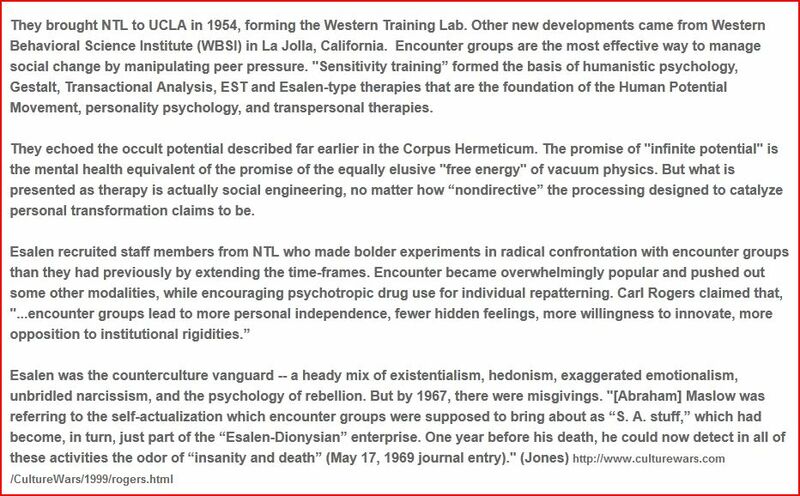 NTL was much more conservative, academically grounded, and cautious than Esalen. 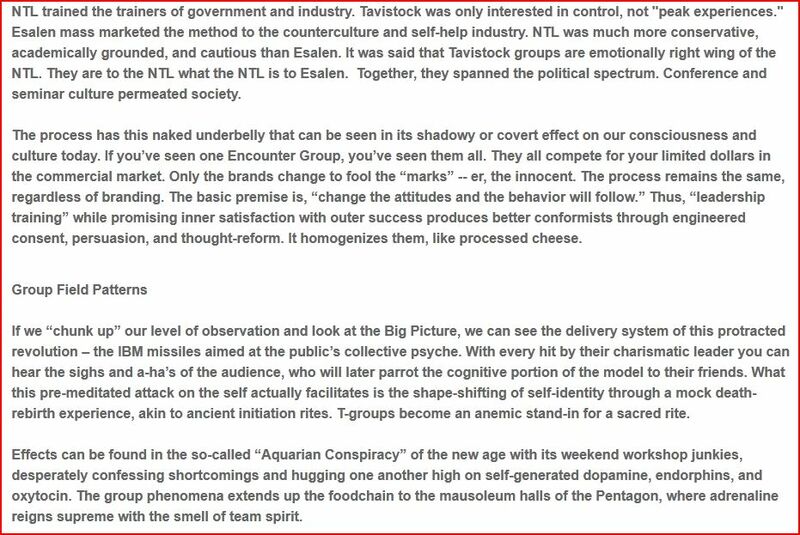 It was said that Tavistock groups are emotionally right wing of the NTL. They are to the NTL what the NTL is to Esalen. Together, they spanned the political spectrum. Conference and seminar culture permeated society. The process has this naked underbelly that can be seen in its shadowy or covert effect on our consciousness and culture today. If you’ve seen one Encounter Group, you’ve seen them all. They all compete for your limited dollars in the commercial market. Only the brands change to fool the “marks” -- er, the innocent. The process remains the same, regardless of branding. The basic premise is, “change the attitudes and the behavior will follow.” Thus, “leadership training” while promising inner satisfaction with outer success produces better conformists through engineered consent, persuasion, and thought-reform. It homogenizes them, like processed cheese. If we “chunk up” our level of observation and look at the Big Picture, we can see the delivery system of this protracted revolution – the IBM missiles aimed at the public’s collective psyche. With every hit by their charismatic leader you can hear the sighs and a-ha’s of the audience, who will later parrot the cognitive portion of the model to their friends. What this pre-meditated attack on the self actually facilitates is the shape-shifting of self-identity through a mock death-rebirth experience, akin to ancient initiation rites. T-groups become an anemic stand-in for a sacred rite. Effects can be found in the so-called “Aquarian Conspiracy” of the new age with its weekend workshop junkies, desperately confessing shortcomings and hugging one another high on self-generated dopamine, endorphins, and oxytocin. The group phenomena extends up the foodchain to the mausoleum halls of the Pentagon, where adrenaline reigns supreme with the smell of team spirit. While mandatory in some sectors, group training is largely voluntary. Is it conspiracy, or 'cons’ piracy'? It’s not that any one segment is willingly culpable, but the collective effect is an enforcement technology, full of misdirecting empty buzzwords like 'evaluation' and jingle slogans. To compound the problem, myths of social engineering now compete with "neuromyths" -- biased distortions of scientific fact -- distorted by the same conditions and biases presented herein. Myths and memes impact society hardest in the educational sector. "Myth-conceptions" about the brain still hamper the teaching process. NTL deliberately created “a new kind of school teacher . . . engaged in teaching as clinical practice.” Teachers “function as a responsible agent of social change” (ability to relate with, manipulate, and evaluate student behavior). “Old value systems” were modified and new ones developed. They tracked behavioral attitudes and achievements. Teachers have been forced to attend seminars so they could use it on their students. Frequently, educational leaders worry about the ethics of deliberately setting out to change people, their ideas, their values, their skills and their relationships. What right do teachers have to try to change students and parents? How can groups and individuals be protected from manipulation? Planned change programs are just what they claim to be. In this way, large segments of society are up- and down-regulated. Simple contagion and media mainstreams such viral notions from there. The content of the process is less important than the result of exercising the reins of holographic control through a Utopian conference culture. It led to a competing host of psychological therapies and seminar solutions that might be likened to “putting a bandaid on a hemorrhage.” It is one reason we have the “spiritual supermarket”, trends in therapeutic treatment, and re-branding of well-established protocols – “old wine in new skins.” Society is left to “bleed out” from worldview warfare – the Big Lie of the therapeutic state. Looking at “effects”, rather than alleged “intent”, is a way to focus on the meaning and practical results of such training, and who it serves. Every practitioner is a witting or unwitting stakeholder. Naturally, there is money to be made at all stages and levels of the highly-competitive game. The bottom line is transforming the paradigm or worldview of the general population, but not for their edification – for the globalist state. Uncertainty is the zeitgeist of our day. We are anxious and unsure. We face climate change, environmental deterioration, emerging infections and incurable viruses, pandemics, bioterrorism, wars, urban violence, soil and water depletion, rampant population growth, GMO food and organisms, hazardous waste, and profound doubts about our earth's carrying capacity. With extinctions, we wonder about our own and our grandchildren's futures, health, and well-being while blankly staring at our “vision boards”, trying to wish up a better future. We feel the impact as loss of meaning and of our cherished ideals. The American Dream is now a myth, gone the way of the dinosaur in the disposable society. This unfortunate situation dominates business and conditions how the world is controlled with psystrat. For example, Brookings Institute and satellite institutions use such techniques to concoct "national agenda" socio-political policies of the US. This is the secret face of sensitivity training that also directs educational reform and economic modeling. No one can resist what they cannot detect. 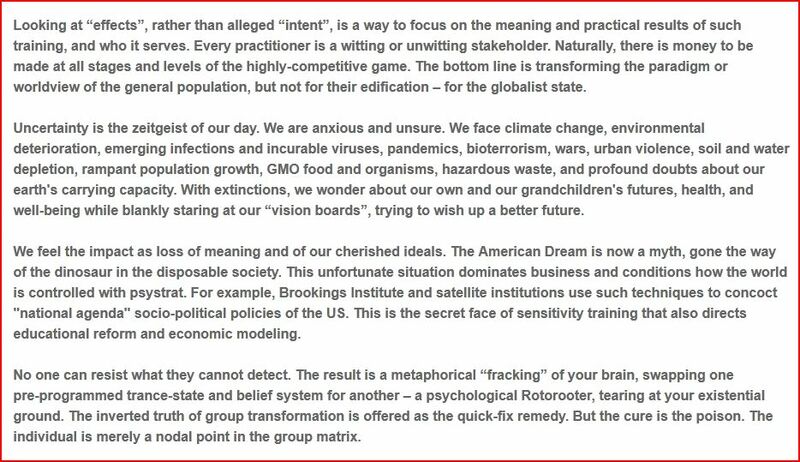 The result is a metaphorical “fracking” of your brain, swapping one pre-programmed trance-state and belief system for another – a psychological Rotorooter, tearing at your existential ground. The inverted truth of group transformation is offered as the quick-fix remedy. But the cure is the poison. The individual is merely a nodal point in the group matrix. 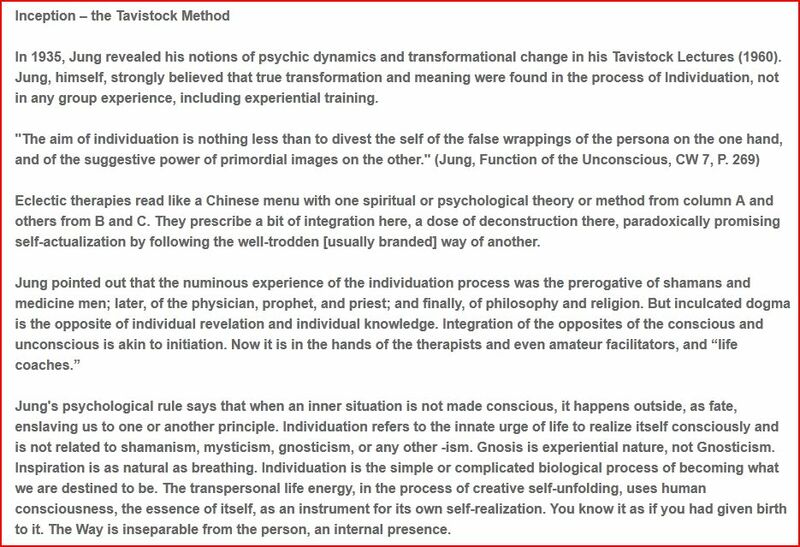 In 1935, Jung revealed his notions of psychic dynamics and transformational change in his Tavistock Lectures (1960). Jung, himself, strongly believed that true transformation and meaning were found in the process of Individuation, not in any group experience, including experiential training. Eclectic therapies read like a Chinese menu with one spiritual or psychological theory or method from column A and others from B and C. They prescribe a bit of integration here, a dose of deconstruction there, paradoxically promising self-actualization by following the well-trodden [usually branded] way of another. Jung's psychological rule says that when an inner situation is not made conscious, it happens outside, as fate, enslaving us to one or another principle. Individuation refers to the innate urge of life to realize itself consciously and is not related to shamanism, mysticism, gnosticism, or any other -ism. Gnosis is experiential nature, not Gnosticism. Inspiration is as natural as breathing. Individuation is the simple or complicated biological process of becoming what we are destined to be. The transpersonal life energy, in the process of creative self-unfolding, uses human consciousness, the essence of itself, as an instrument for its own self-realization. You know it as if you had given birth to it. The Way is inseparable from the person, an internal presence. In empire building and a world of endless change, it's easier to conquer minds than space, especially in the electronic era. Jung’s dynamic theories formed the basis not only of his therapeutic applications, but of a vast social-engineering scheme. 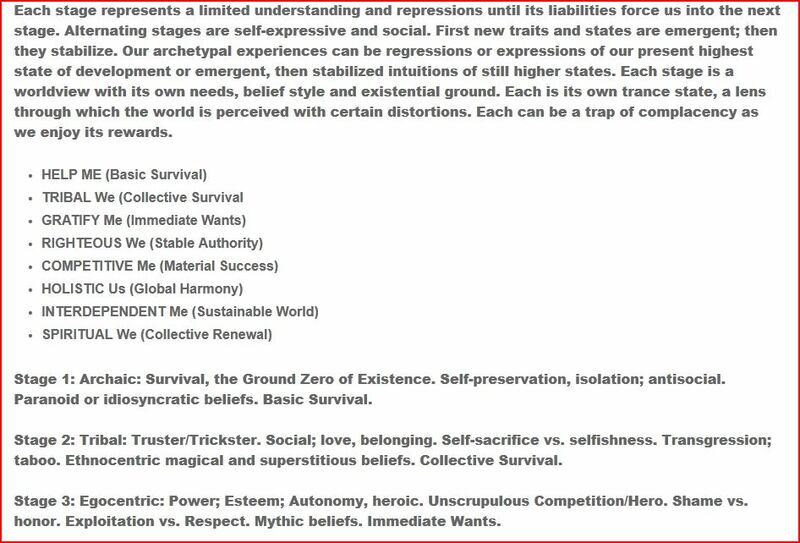 NTL still promotes inner child and shadow archetype work in their sessions. 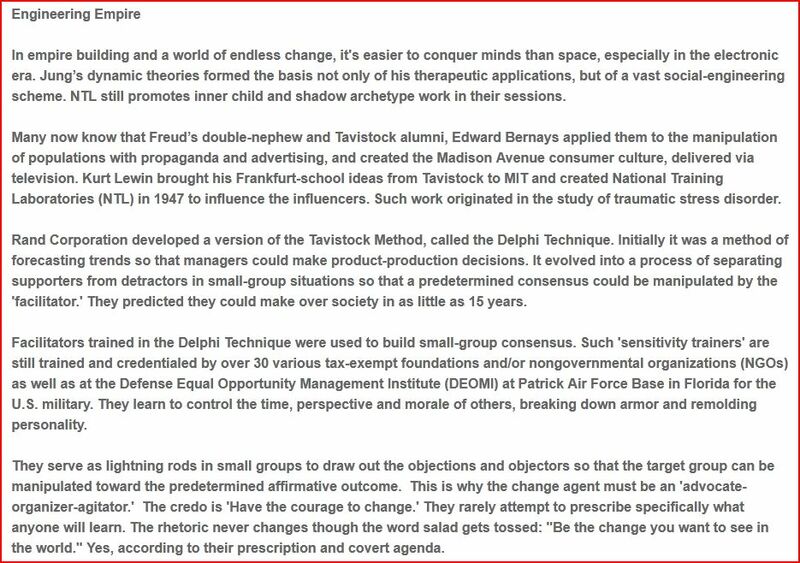 Many now know that Freud’s double-nephew and Tavistock alumni, Edward Bernays applied them to the manipulation of populations with propaganda and advertising, and created the Madison Avenue consumer culture, delivered via television. Kurt Lewin brought his Frankfurt-school ideas from Tavistock to MIT and created National Training Laboratories (NTL) in 1947 to influence the influencers. Such work originated in the study of traumatic stress disorder. Rand Corporation developed a version of the Tavistock Method, called the Delphi Technique. Initially it was a method of forecasting trends so that managers could make product-production decisions. It evolved into a process of separating supporters from detractors in small-group situations so that a predetermined consensus could be manipulated by the 'facilitator.' They predicted they could make over society in as little as 15 years. Facilitators trained in the Delphi Technique were used to build small-group consensus. Such 'sensitivity trainers' are still trained and credentialed by over 30 various tax-exempt foundations and/or nongovernmental organizations (NGOs) as well as at the Defense Equal Opportunity Management Institute (DEOMI) at Patrick Air Force Base in Florida for the U.S. military. They learn to control the time, perspective and morale of others, breaking down armor and remolding personality. They serve as lightning rods in small groups to draw out the objections and objectors so that the target group can be manipulated toward the predetermined affirmative outcome. This is why the change agent must be an 'advocate-organizer-agitator.' The credo is 'Have the courage to change.' They rarely attempt to prescribe specifically what anyone will learn. The rhetoric never changes though the word salad gets tossed: "Be the change you want to see in the world." Yes, according to their prescription and covert agenda. Change agents manipulate the target group to trust them by voicing mutual concerns, then breaking the larger group into small interactive groups, while profiling the weakest and the loudest opponents. To facilitate the ‘group success’, the 'change agent' becomes devil's advocate, questioning opposition leaders while playing on the fears of individuals with weaker convictions. A wedge is driven between them that escalates tensions, muddying goals. 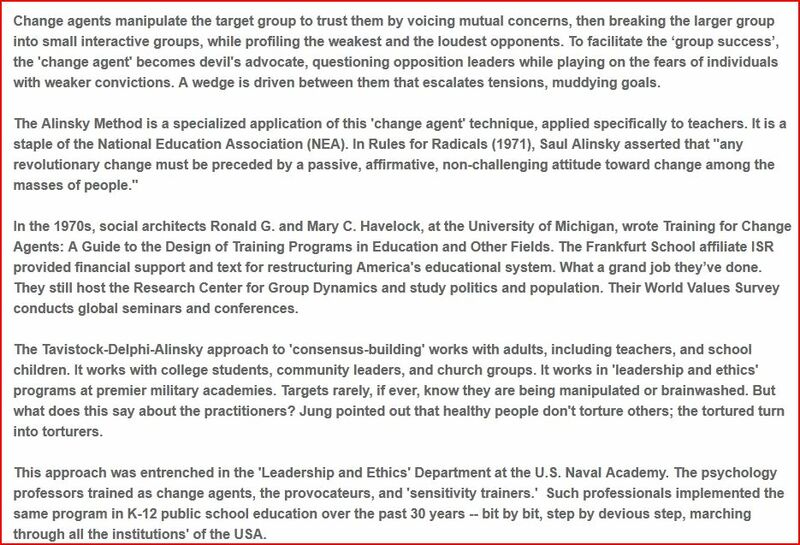 The Alinsky Method is a specialized application of this 'change agent' technique, applied specifically to teachers. It is a staple of the National Education Association (NEA). In Rules for Radicals (1971), Saul Alinsky asserted that "any revolutionary change must be preceded by a passive, affirmative, non-challenging attitude toward change among the masses of people." In the 1970s, social architects Ronald G. and Mary C. Havelock, at the University of Michigan, wrote Training for Change Agents: A Guide to the Design of Training Programs in Education and Other Fields. The Frankfurt School affiliate ISR provided financial support and text for restructuring America's educational system. What a grand job they’ve done. They still host the Research Center for Group Dynamics and study politics and population. Their World Values Survey conducts global seminars and conferences. The Tavistock-Delphi-Alinsky approach to 'consensus-building' works with adults, including teachers, and school children. It works with college students, community leaders, and church groups. It works in 'leadership and ethics' programs at premier military academies. Targets rarely, if ever, know they are being manipulated or brainwashed. But what does this say about the practitioners? Jung pointed out that healthy people don't torture others; the tortured turn into torturers. This approach was entrenched in the 'Leadership and Ethics' Department at the U.S. Naval Academy. The psychology professors trained as change agents, the provocateurs, and 'sensitivity trainers.' Such professionals implemented the same program in K-12 public school education over the past 30 years -- bit by bit, step by devious step, marching through all the institutions' of the USA. Consultants consult only to a group, not to individual members, and only within the time boundaries prescribed. The consultant's role often is the subject of much consternation among members, which is deliberate, in the interest of assisting members to pursue the task of the event in which they are involved. The consultant does not engage in social amenities, advice giving, or nurturing, but performs his or her task by providing interventions for the group's consideration and reporting his or her observations back to the group. Thus, the consultant confronts the group by drawing attention to group behavior. This is done by means of description, process observation, thematic development, and other interventions, some of which are designed to shock the group into awareness of what is happening. Participants typically experience some pain as they explore issues of authority, responsibility, boundaries (of input, roles, tasks and time) projection, organizational structure, and large-group phenomena. Detecting short- and longterm “effects”, rather than alleged “intent”, is the only way to focus on the real meaning and practical results of such training, and who it serves. The bottom line is that what is transformed is the paradigm, zeitgeist or worldview of the general population. It dominates business and how the world is controlled with psystrat. No one can resist what they cannot detect. Each stage represents a limited understanding and repressions until its liabilities force us into the next stage. Alternating stages are self-expressive and social. First new traits and states are emergent; then they stabilize. Our archetypal experiences can be regressions or expressions of our present highest state of development or emergent, then stabilized intuitions of still higher states. Each stage is a worldview with its own needs, belief style and existential ground. Each is its own trance state, a lens through which the world is perceived with certain distortions. Each can be a trap of complacency as we enjoy its rewards. Stage 1: Archaic: Survival, the Ground Zero of Existence. Self-preservation, isolation; antisocial. Paranoid or idiosyncratic beliefs. Basic Survival. Stage 2: Tribal: Truster/Trickster. Social; love, belonging. Self-sacrifice vs. selfishness. Transgression; taboo. Ethnocentric magical and superstitious beliefs. Collective Survival. Stage 3: Egocentric: Power; Esteem; Autonomy, heroic. Unscrupulous Competition/Hero. Shame vs. honor. Exploitation vs. Respect. Mythic beliefs. Immediate Wants. Stage 4: Moral/Patriotic. Rules; Initiative. Shame and guilt vs. conformity and conventionality; purpose, virtue. Systematized truths. Emotional, nostalgic beliefs. Stable Authority. Stage 5: Materialist. Reasoning; mental analysis. Rational beliefs, truth; goodness; consumerism, greed. Head vs. heart. Progressive if rewarded, compulsive, workaholic. Perspective. Rational beliefs. Material Success. Stage 6: Wise Empath. Service, rapport, intimacy, empathy. Politically correct. Inner wisdom, meaning. Self-actualization. Intuitive, mystical beliefs. Global Harmony. Stage 7: Distancer/Self. Paradoxical; individuated, reclusive; universalist. Deconstruction and Synthesis, gestalt, the big picture. Integral, synergetic beliefs. Sustainable World. 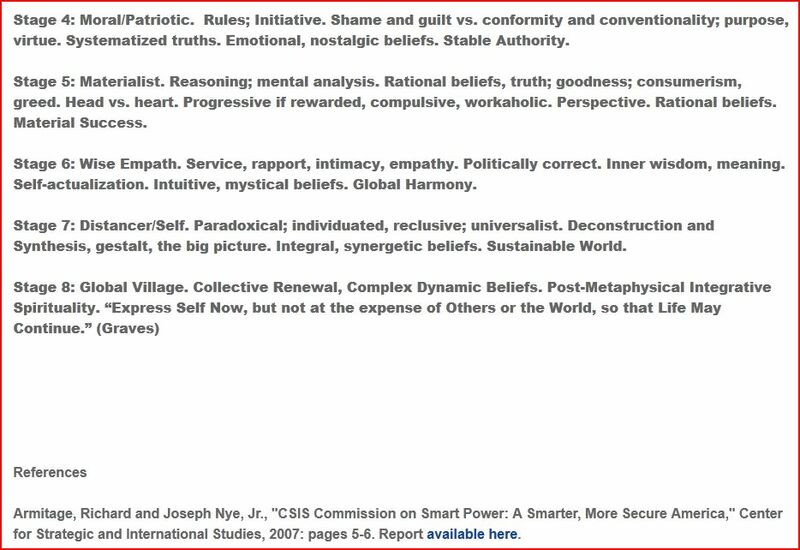 Armitage, Richard and Joseph Nye, Jr., "CSIS Commission on Smart Power: A Smarter, More Secure America," Center for Strategic and International Studies, 2007: pages 5-6. Report available here. Banet, A.G., Jr., and Hayden, C. (1977) The Tavistock primer, In J.E. Jones and J.W. Pfeiffer (Eds.) The 1977 annual handbook for group facilitators, San Diego, CA; University Associates. Bion, W. R. (1961). Experiences in groups. Basic Books: London: Tavistock. Coleman, John, Conspirators’ Hierarchy - The Story of the Committee of 300, Tavistock institutions in the United States. Ferguson, Marilyn, The Aquarian Conspiracy (Los Angeles: J.P. Archer, 1980). Hayden, C., & Molenkamp, R. (2004). The Tavistock Primer II. In S. Cytrynbaum and D. Noumair (Eds. ), Group Dynamics, Organizational Irrationality, and Social Complexity: Group Relations Reader 3. Jupiter, FL: A. K. Rice Institute for the Study of Social Systems. Rambo, Lewis R., Understanding Religious Conversion, Yale University Press, 1993.